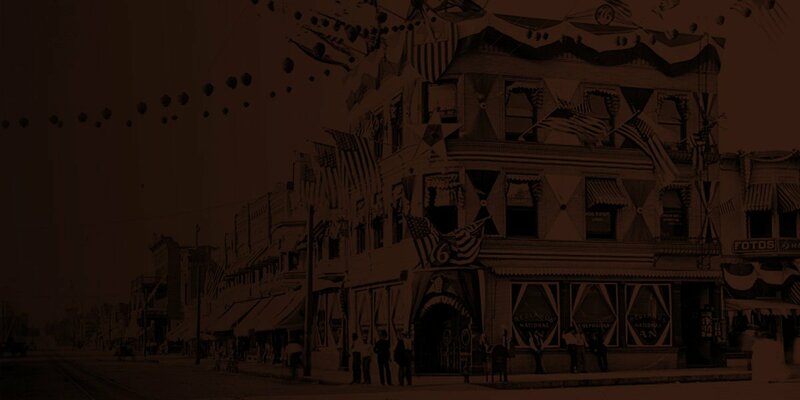 In 1880, early Redlands developers, Edward G. Judson and Frank Elwood Brown bought land for the City of Redlands site and began selling property the next year. The success of their venture brought nearly a 1,000 individuals to the East San Bernardino Valley. Judson and Brown conceived their land and water project while living in Crafton at the Crafton Retreat, owned by Myron and Elizabeth P. Robbins Crafts. The Craft family bought land in Crafton and settled there in 1860. In September of 1886, Myron died of pneumonia in Crafton and was buried at the base of the Crafton hills south of the Crafton Retreat home. Discussion began in earnest about a more suitable burial for the well-known Myron Crafts. Judson and Brown suggested the hilltop land of south Redlands, which they had just purchased for $3.50 per acre from the Southern Pacific Railroad. Brown knew his new “High Line” taking water from the Santa Ana River would not deliver water to the proposed site until 1890 or soon thereafter. His plans to deliver Bear Valley water to the San Jacinto Valley (Moreno) required a lengthy pipeline that would skirt the bluffs of the Crafton Hills and cross Redlands Heights on the pipe’s journey south. Mr. Brown suggested that Crafton, Lugonia and Redlands water companies donate water for a cemetery. The source of water for most of these water companies was the Santa Ana River and its tributary, Mill Creek. Just when water could be brought to Hillside was not a looming concern, but a proper site for Myron Crafts was for many in Crafton, Lugonia and now Redlands. Several deaths had taken place in the eastern valley with burials taking place in San Bernardino. This issue played on community pride and independence from the larger San Bernardino to the west. So on June 8, 1886 the Judson and Brown real estate firm donated 22 acres to the new Hillside Cemetery Association and created its five-member board of directors. John W. Edwards was the first secretary and grocery owner in Redlands. Edward G. Judson, Charles Putnam, A.L. Park, K.C. Wells, a pioneer banker, and J.S. Edwards served on the first board. J.S. Edwards was the first cemetery superintendent and was assisted by his business packing house partner, Wilbur N. Chamblin. They both plotted the drives and lots for the cemetery. The bleak forlorn treeless hillside received its first occupant, Charles H. Gothier, on June 12, 1887. The Reverend Gothier was the first settler of the future Smiley Heights in April of 1883. Gothier was a health-seeker from Tennessee, who spent the winter of ’82 on the Barton Ranch domiciled in the comfortable Barton Villa. Homesteading on the heights meant trudging all his water from the distant Zanja. His death from consumption was not unexpected. The marker on his grave is etched “First Civil War burial” instead of first burial in Hillside Cemetery. He did serve as a chaplain in the Civil War and is joined by 151 other Civil War veterans now. Myron Crafts was also moved from Crafton to Hillside and given a prominent granite spire marking the grave. The City elected to take over the cemetery operations in 1918. Taxes could be used to supplement the operation that never met operating expenses. The third project was the combination office and comfort station in 1922. The Daily Facts announced on December 7, 1922 the $4,000 building located near the Sunset Avenue entrance. Today the office houses the cemetery records and staff offices. The fourth accomplishment was the 1928 mausoleum crafted in Egyptian architecture. The 31 x 86 foot structure is designed to hold 250 crypts and cost $60,000. Marble for the mausoleum arrived from Alaska in July 1928. The dedication in August 1928 revealed the finished building cost $70,000. In 1922 the grave of King Tut was located in Egypt and the mummy made a tour in the United States sparking interest in all things Egyptian. Plans for a new mausoleum were announced in April 1937. In the midst of the Great Depression the project was stalled for two decades. However, the W.P.A. and the California Emergency Relief Administration bestowed permanent construction projects that grace the cemetery today dating from the 1930’s. New stone walls with cobblestone construction were added to the Sunset Drive side of the cemetery. The W.P.A. placed several bronze plaques marking their work in the cemetery. Expansion of the cemetery was successful in 1947 with Cemetery Superintendent Franklin acquiring 900 more gravesites. The City announced new cemetery lot prices in January 1950 with new operation rules and a 25% increase in lot prices. The increase was intended to gather additional funds to build the 1958 Mausoleum, which contains 768 crypt spaces. Another addition to the 1958 mausoleum in 1972 added 350 new crypt spaces. The Babyland statue was donated by Mr. E.W. Raley in 1963. The cemetery has not acquired new property since January 1961. Most recently John Paul Frehner undertook an Eagle Scout project consisting of cleaning and painting the exterior of the new mausoleum, relandscaping the courtyard and the installation of several benches in the cremation garden. The project involved over 400 volunteer hours. Approximately $15,000 in funds and in-kind donations were raised. 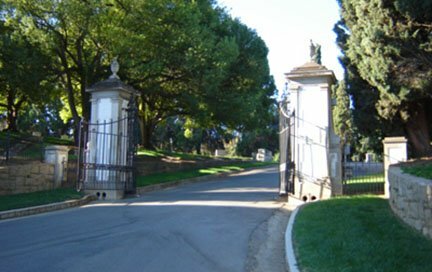 In the late 1990’s the Friends of Hillside Cemetery was established. The committee, headed by Dr. Harold Hill hopes to establish an endowment fund for the cemetery and foster continual maintenance and upkeep of the cemetery. Hillside Cemetery is the oldest continuous operated business in the City of Redlands and predates the City by two years. The cemetery has some 30,000 graves and continue with space available for another 100 years. The Redlands Area Historical Society wishes to commend the City Staff and Friends of Hillside for their continued efforts in maintaining and preserving this unique and historic resource of the City.